Kildare may have won the battle to host Saturday's All-Ireland football qualifier clash with Mayo but they will lose the crowd war in Newbridge. In an ironic twist, which most Kildare supporters would not have anticipated, they will be outnumbered two to one by the green-and-red of Mayo for one of the most eagerly-anticipated qualifier ties since they were first introduced 17 years ago. Mayo have around 3,500 season ticket holders, all of whom are entitled to be accommodated, while another 1,500 tickets will be distributed to clubs in the county. That takes their guaranteed allocation to 5,000 and it's understood that many of those who had purchased tickets online were from Mayo. Kildare have around 1,000 season ticket holders, while another 1,500 are being distributed among the clubs. The remainder of the 8,200 allocation will go to players, sponsors etc so by the time referee David Gough throws in at 7.0, St Conleth's Park will look more like a home venue for Mayo than Kildare. Tickets are priced at €20 (adults) and €5 (juveniles). With Kildare's right to host the game reaffirmed yesterday after a two-day stand-off, the Central Competitions Control Committee (CCCC) switched the Tyrone v Cavan qualifier from Croke Park to Brewster Park, Enniskillen which was the original venue before a double-header was announced for HQ. According to the draw, Cavan had the right to stage the game but Kingspan Breffni Park is currently closed for work on the pitch. Both the Kildare v Mayo and Cavan v Tyrone games will be on Sky Sports. 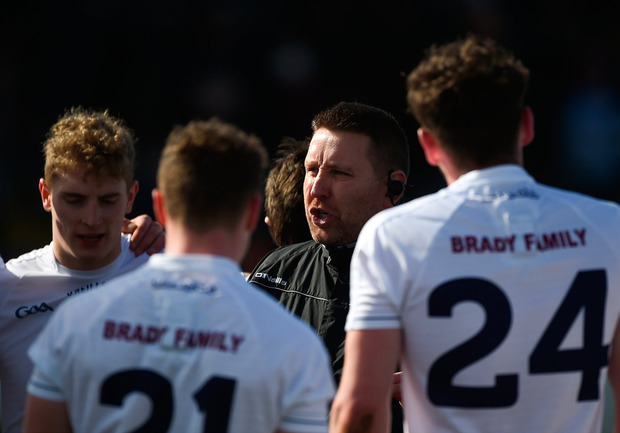 The climbdown by the CCCC following two chaotic days, during which Kildare announced a boycott of Saturday's game after it was fixed for Croke Park, is still reverberating in GAA circles, amid fears that it could have knock-on implications as soon as next month. If Kildare win two more games and qualify for the 'Super 8s', they will be entitled to one 'home' tie. That would re-open the debate on whether St Conleth's Park is fit to stage big occasions, especially one as significant as a round-robin leg of the All-Ireland quarter-finals. If Kildare reach the 'Super 8s', the draw will have decided whether they are on the Galway/Kerry or Dublin/Donegal side of the round-robin. It could leave them facing Dublin in Newbridge in front of 8,200, a game that would, in normal circumstances, be expected to attract around 50,000. Grounds must meet strict health and safety criteria, but no minimum capacity is mentioned in the regulations so Kildare would be entitled to insist on playing in St Conleth's Park, as they successfully did this week. There can be no change in the regulations until next year's Congress and, even then, it will be difficult to convince counties to agree to a minimum capacity stipulation as the 'Super 8' concept was sold on the basis that any county who qualified would get one 'home' game. While Kildare were preoccupied with having Saturday's game in Newbridge, Mayo, Cavan and Tyrone have all been dragged into a controversy not of their making. It has been disruptive for all three as they approach a crucial period in the qualifying race.